On one of our earlier visits to Calcutta, we met her at a dinner party. She was sitting in a corner somewhat aloof. As we entered, the party was in full swing with whisky flowing freely. After we were duly introduced the party got back to its boisterous self and everybody went back to loudly vocalizing their opinion on all subjects under the sun and in the process ignoring everybody else’s, Bengali style. The forlorn looking lady in the corner unobtrusively got up and stood behind us. "Do you live outside the country?” She asked. She knew the answer; for that she did not have to be clairvoyant. We just arrived a few days ago, not long enough for the sun and dust to work on our faces. She pulled a chair and sat down next to us. First thing I noticed that she was not at ease with the environment, but not because of other people around her were not accepting her or were not friendly. The detachment appeared to be by choice on her part, but her marked openness with us also was hard not to be noticed. We talked about the amazing varieties of fish in Gariahat market , about sarees in Park Street, about a couple of common acquaintances we discovered we shared; subjects of America did not come up at all. LIMITED PARKING AT THE HOUSE FOR ABOUT 12 CARS. Last Sunday (Feb 28th 2010) the noted Bengali theater personality Kumar Roy died in Kolkata after a protracted heart ailment at the age of 84. 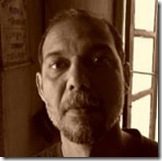 Kumar-da was long associated with the theater group Bohurupee which he joined in 1949 and was a close associate of late Sambhu Mitra. He was a director, playwright and also an actor. He had done roles in several plays like ‘Gallileo’, ‘Rakta karabi’, ‘Baki Itihas’, Bisarjan and ‘Nabanna’ among others besides acting in films. He also worked as a professor at the Rabindra Bharati University. Kumar Roy also headed the Paschim Banga Natya Academy for quite some time. He had also penned many books. 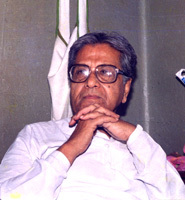 He was awarded the Sanget Natak Akademi award in 1983. Although I never had the opportunity of meeting him in person, but had the good fortune of speaking to him few times. It was he who published my play “Ron” in “Bohurupi” (of which Kumar-da was the editor) the well known theater journal of Kolkata. He said how much he liked the play and thought it was an important addition to the repertoire of plays that Bohurupi has published over the years. Later, he also published another play of mine, “Satyameva”. He had asked me to meet him when I was in Kolkata. Unfortunately I never had the opportunity and I will repent it all my life. I hope and pray that his soul rests in peace. Without you , I am not , am I? Let us start with me, my relationship with theatre, in general and with open theatre, in particular. I might be digressing from the central issue when I discuss these additional and presumably “irrelevant” personal stories. I could have constructed this explanation like a theoretical manifesto or just made a compilation of various people’s experience of undergoing this process. But that doesn’t adequately answer the question of how and where, who first laid down the initial few precepts of open theatre. Under what socio-political and economic conditions did they say these things, what were their relations to their immediate environment while thinking about open theatre? I tried to structure this article to the best of my abilities, but eventually, I realized that open theatre can’t be defined under certain compartmentalized topics; rather I will try to reproduce the stream of consciousness that gave birth to them. In recounting my thoughts, I will talk about my group Bibhaban but let me question why I ventured into theatre, in the first place.